The Lexmark Z23 is a printer which may well have passed you by up until this point. Still, not to worry, there is probably a very good reason for this lack of knowledge where the Lexmark Z23 is concerned. To be frank, the Lexmark brand is growing in popularity these days, but has had to battle with some very big names on the scene over the years, including the likes of Hewlett-Packard. 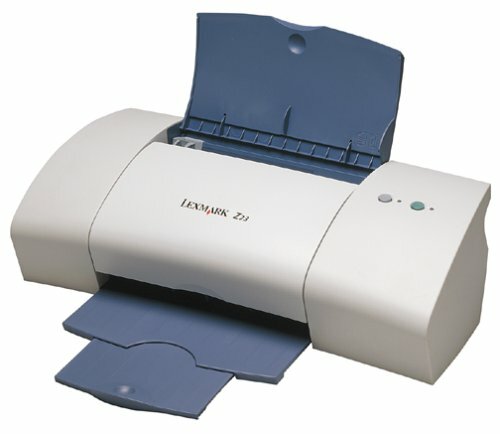 So, does the Lexmark Z23 warrant your attention in a very competitive market? On a physical basis, the Lexmark Z23 is a printer which is certainly easy on the eye. The Lexmark Z23 offers a smooth white finish, sometimes a little creamy from certain angles and what's more, there are curves a plenty where the Lexmark Z23 is concerned. All in all, this is a very pleasing printer in design terms, but what perks does it offer if any? Well, a key advantage where the Lexmark Z23 is concerned is the sheer quality of print outs. Whilst many modern printers rely rather heavily on gimmicks and the like in order to grab your attention, the Lexmark Z23 simply lets the results do the talking. What's more, printer ink is rather affordable for the Lexmark range and as such, the Lexmark Z23 shouldn't cost you an arm and a leg to run. Of course, all printers have their limits and the Lexmark Z23 is no different, but if you are looking for an affordable, easy to run printer and one which is pleasing on the eye, then the Lexmark Z23 is certainly worth considering as it ticks all these boxes.